When it gets to this time of year two things overtake my mind..
1. What can I do to help others? 2. What goal can I set myself for next year to motivate me to get fitter? I usually end up combining both of these and signing up for some challenge or other crazy enough that I can fundraise for whichever charity I chose that year. Some years I have searched a particular cause I want to fundraise for, other times, more so in my early challenge/fundraising days, I have seen an opportunity presented by a particular charity and taken that on despite not having any real connection to their cause. If I could, I would fundraise for every charity out there but I can’t..
As of September 2015 there were over 166,000 charities registered in England and Wales! (Charity Commission -recent charity register statistics, September 2016). All do a fantastic job. In addition to this there are a large number of ‘not for profits’ fundraising for important causes who, because their annual income is less than £5,000, are not required to register with the Charity Commission. Last year in the UK charitable donations from the general public, people like you and me, were worth £9.6bn to registered charities! 67% of the adult population made a donation and off these 17% donated through taking part in some kind of fundraising event. (CAF UK Giving 2015). It’s a lot harder for some than others to raise their profile and gain support. I also find that the level of support and appreciation you get from charities can differ immensely! So with a lot of competition out there for your donations what should we consider when choosing an organisation to fundraise for? Your time and money is valuable and you can afford to be selective over which charity you support. You should be able to get what you are looking for out of the experience whether it’s just knowing your money is going directly to where it’s needed or whether it’s support for whichever challenge you are taking on. Taking on a challenge for a charity, especially a small charity, can help to raise their profile particularly if there’s a team of you or you are a corporate group. For some of you it may be obvious which charity you want to support, for others it may need more thinking about so here are a few things to consider. If you or a member of your family has been helped or supported by a charity or affected by a particular illness or need then it’s understandable that you want to give something back. If you’re been helped directly by a particular charity you may already have a contact here so setting it up should be easy. It will probably be easier for you to fundraise too because you will be passionate about the cause, but others will know of your motivation and will be eager to support you. Is there a small local charity that is directly contributing to your community? You can ask your local CVS as mentioned above or search a directory of charities on the Charity Choice website by location. You can also search by ‘charitable purpose’ from Animals to Visual Impairments. There is information on each charity and contact details. Make sure the values and purpose of the charity match what you are looking for. You may find what you’re looking for on their website, but if you are like me and prefer to dig a bit deeper check out their Annual Reports. Providing it is a charity registered in England and Wales you can access Annual Reports on the Charity Commission website under the ‘view accounts’ section. The easiest way to search for your charity is by using their registered charity number which by law should be displayed on their website and all correspondence. If you haven’t already decided on your charity challenge such as the Snowdonia Challenge (If you haven’t you will find some inspiration here!). But perhaps you have chosen your charity and are looking to them for inspiration in their range of events they provide for fundraisers and supporters. Larger charities may offer a wide range of challenges from half marathons to multi-day overseas treks, however, some of the smaller charities will rely on independent fundraisers to organise their own events. If you need some help in organising your own event or have links with a small charity who would be interested in providing challenge events please see our Charity Challenges page or contact me for details. Finally trust your instinct. You know what you want to get out of your challenge and what you want to achieve. You may be happy just to know that at the end of it you have handed over a contribution to help others, in which case the very minimum you should expect is a thank you letter! A lot of your precious time and effort and other peoples sponsorship will go to support your chosen charity and you want to make sure you get the right level of satisfaction and recognition for this. Remember lots of small charities are run entirely by volunteers and wouldn’t survive without your donations, but you may have to be a bit more creative yourself when it comes to resources. If they celebrate volunteers achievements in their newsletter can they include your story? Fundraising advice – your charity should be able to provide you with advice on fundraising such as how to set up a fundraising page, how to gain sponsorship etc. If they don’t then please let us know and we have a Fundraising Pack we can send you. Fundraising resources – charities have a range of promotional items such as balloons, t-shirts and posters they may be able to send you to help promote your event. They will also have practical resources such as sponsor forms they can send you. 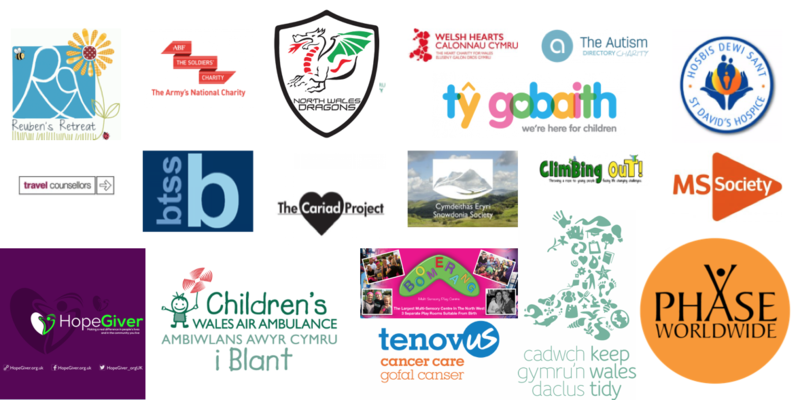 We have a fantastic range of charities that we work with, you can find details of them and links to their websites here. If you are a charity and would like to know more about how we can help you provide tailored fundraising opportunities and support your volunteers you can find more information here.